1:02 PMSome of y’all are still arguing over what happened with Lawrence on Insecure, but let’s not overlook the tremendous sweatshirt that Issa Rae was wearing at one point. If you want to know where to find it, it’s here. You might know Dan Gilbert as the owner of the NBA’s Cleveland Cavaliers. But he’s also a big landowner in Detroit. And by landowner, I mean part of one of the bigger real estate undertakings in the Motor City. His company, Bedrock, posted the above ad for an office building downtown. Clearly, this is nowhere close to representative of what that city looks like, so the words of that slogan are doubly insulting. Well, Gilbert apologized. And it wasn’t just a my bad, it was actually pretty lengthy and detailed, so good for him, I guess. Life can be a hassle. Staying organized, between identification, money and keys, is not exactly the easiest task. So what better way to handle one of those tasks than letting your employer embed a microchip in your hand, right? All you’ve got to do is swipe your claws around the office to get into the building, or to buy lunch! So, convenient, no? If my bank could do this so I didn’t have to carry money around, I’d consider it. But, for the most part, having the job to track your every movement is suboptimal for basically everyone on earth. If you ever doubted that John McCain was an American hero, you can put that to rest. The Arizona senator — who was captured in Vietnam and held as a prisoner of war before going on to an illustrious political career, including a run for president — was diagnosed with brain cancer last week. But he’s coming back to the Senate on Tuesday because his nation needs him on the latest Republican health care bill. This isn’t just a matter of optics and symbolism — his vote is critical. He could be the difference in whether America takes care of itself. Robert Griffin III has one more chance in the NFL. After he was run into the ground in Washington, thus torpedoing his career for one playoff win, he was forced to sit an entire season. Then he split with his wife, and before the divorce papers were dry he was having another baby with an Estonian heptathlete. Oh, and wearing suits on the beach. Now, the Los Angeles Chargers are going to bring him in for a workout. The issue wasn’t the talent most recently. It was the ability to stay on the field. Coffee Break: When I first heard “Shimmy Shimmy Ya” in a Samuel Adams ad, I wasn’t disappointed. Such is the life cycle of popular and transcendent music genres. Now, the RZA is teaming up with Chipotle to bring you original beats. You can make your own, too! Snack Time: If you’ve ever wondered why Anthony Scaramucci was brought back to the White House after being rebuffed for a job the first time around? Well, he had to complete his “How to Act Like Donald Trump” training. Dessert: When Curren$y drops new mixtapes, I keep you informed. Behold, The Champagne Files. 12:55 PMWe’re still in the dog days of summer, and it feels like it’s never going to end. But HBO’s Insecure is back, which means the Twitter timeline is going crazy. 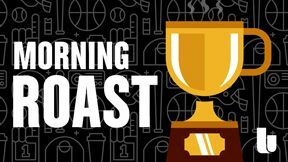 The Morning Roast was also an NFL takeover, although we did talk a lot of hoops too. I'm going to crowdsource this, then write about it. When you hear 'minority' do you primarily associate it with 'persecuted' or 'subverted'? One of my heroes died Saturday. After a short battle with cancer, the man who exuded cool and was the pride and joy of black Washington, Jim Vance, passed at the age of 75. He was a reporter and news anchor at NBC4 in D.C. for nearly 50 years, which is much longer than I’ve been on this earth. Even though we suspected it would be soon, this news hit many people, not just in the news industry but also around the community in general, extremely hard. Vance was our rock, our soothing voice, our stalwart. When I heard the news, I poured my heart out. You could call it palace intrigue, but alas, there is no king. The week in politics has started off with a bang, and President Donald Trump’s son-in-law, Jared Kushner, is saying publicly that he did not collude with Russia in any way. Meanwhile, Attorney General Jeff Sessions, who many people think is likely on his way out of that job, actually was called “beleaguered” by the president, which is about as weird as it gets. He picked Sessions, mind you. Let’s not forget that Trump’s lawyer is also insinuating that the president might actually pardon himself in this situation. Yikes. It’s amazing what happens when you make a movie with black women, apparently. Turns out, tons of people go to see it. This is still news in Hollywood, but Girls Trip did an incredible job at the box office this weekend for its opener, to the tune of $30M, which is no small matter. It came in second in the country, and I can’t imagine it will slow down too much, considering how topical it is as a summer film. It’s also worth noting that the film’s director, Malcolm D. Lee, just signed a first-look deal with Universal, so make sure to watch his space. The Conor McGregor/Floyd Mayweather fight has reached peak ridiculous. Draymond Green, as in of the Golden State Warriors, decided he was going to take a shot at McGregor via Instagram, which tells me that Dray has a little too much time on his hands this summer. But because McGregor is never one to back down from a fight, no matter how petty, he jumped into the comments and fired back at Green, saying that he was rocking a C.J. Watson jersey in fact, which is basically the weakest comeback ever. This bout can’t be over soon enough. Coffee Break: The things that happen in American prisons, as a matter of course, are typically pretty unspeakable. Between prisoner abuse, overcrowding and our general predilection toward locking people up forever, it’s bad. Now, a jail in Tennessee is offering vasectomies for reduced prison time. This is not OK. Snack Time: I love a good carbonara. Simple, elegant and delicious without being overpowered with flavors that are doing too much. But this recipe? Well, it caused some controversy. Dessert: I don’t want nor need to know what Fat Joe is going for here, but it will always be hilarious to me. 11:50 AMTraining camp is upon us, so ESPN’s 32 NFL Nation reporters have been hitting the bricks all weekend, appearing all over the network to get fans ready for the season. Things were no different this week with the roasters. With Kyrie Irving demanding out of Cleveland via a trade, we wonder: Is playing for LeBron James the actual issue here, or does Uncle Drew really want to lead a team? If the point guard were to get dealt, it would have reasonably large ramifications across the rest of the NBA. But there are also quite a few other people looking to make moves, including Derrick Rose, who might be headed to a contender. Of course, no one needs NFL experts when Mina Kimes is around, because she basically knows everything about the league. No, seriously. So she ran down her top storyline of the season at this point, and we even got our full NFL highlight music to boot, a theme we’d return to quite frequently. After that, we chatted with Michael Rothstein, who covers the Detroit Lions. He was refreshingly honest about their chances in the upcoming season to win the NFC North — which, as long as the Green Bay Packers and Aaron Rodgers are still in the division, isn’t going to be a realistic goal. We also got an update on where things stand with franchise legend Calvin Johnson, who apparently might be looking to get back into football. Of course, former Ole Miss coach Hugh Freeze has been dominating the headlines recently because of his proclivity for calling escorts using his state-funded cellphone. He’s out of a job, and his predecessor, Houston Nutt, is the one who dropped a dime on him. But there was one detail of the story that went slightly underreported. The university had to cancel its annual event to teach ladies about college football, at which the parting gift was of, course, a cookbook. From there begat an entire separate conversation about which workshops and seminars we would launch if we could. ESPN’s Katherine Terrell, who covers the Cincinnati Bengals, joined us to talk about where that squad could be headed, which subsequently turned into a long discussion about whether the Pittsburgh Steelers are the best team in the AFC North, or is it the Ravens. And we got more storylines from Mina. By the time we got around to talking about The Bachelorette, Christian Yates had made it back from his artisan shoehorn pop-up shop at the yacht club to discuss the hometown visits. The Dean situation was the primary discussion, considering how poorly things went with his father on the show. Also, however, as the one who’s gone now, we had to speculate on who’s got the best chance to win going forward. For Top 5, Domonique Foxworth was impressed by LeBron James’ sneak diss move toward his teammate Irving in which he put out a video listening to a Meek Mill song about loyalty. It was beyond petty, but who knows what his intentions were? Also, there’s Nutt’s incredible takedown of Ole Miss, which is one of the best sneak disses of all time. So we made it a Top 5, and Mr. Foxworth dominated. The takeover continued with John Keim, who covers Washington’s NFL franchise. Clinton Yates managed to keep his yelling to a minimum, and they broke down exactly why Kirk Cousins might have a great year. After breaking down the defense, Foxworth did his best to get his co-host riled up, and it just might have worked. Barely. Speaking of franchises in a relatively reasonable state of flux, the Dallas Cowboys are having offseason issues. Quite a few players have had minor situations, but not enough to necessarily cause large-scale overhauls, which got Domonique thinking. There is a sliding scale of offenses that will trigger major penalties, depending on the number of touchdowns you score. The same works for coaches with off-field infractions. Big scorer? Get away with more stuff. Simple as that. He explains it in more detail. Lastly, we talked to Seattle Seahawks reporter Sheil Kapadia, who was smart enough to admit that he didn’t even know as much about the team as Mina, which is a great way to ingratiate yourself to the program.